I arrived home not having seen myself in a mirror while in the hospital. Even though I had an inkling that it wasn’t going to be pretty, seeing my neck was a big shock. Really!? This can ever look normal again?!?? Fortunately I had a good supply of neck-camouflaging scarves. This photo was taken at a family wedding three months later. 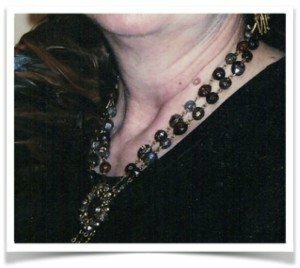 And to my relief, by my next fancy-dress occasion eight months after surgery, my neck looked like this. No scarf needed. The nurse was right, and I came to appreciate my body’s capacity to recover. I also became aware that recovery is a cooperative effort between my body and me. It has the capacity. I need to do my part. Start by believing recovery is possible. To be clear, I’m not talking about positive thinking where you make a statement that clearly is not true. When I was sixty pounds over my best weight and felt like death warmed over, it would not have done any good for me to say to myself, “I am thin and energetic.” I have never been able to relate to this approach. 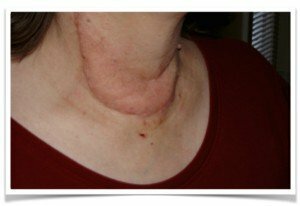 When my neck looked so awful, it was hard to believe the nurse’s reassurance. But I think what was most important was that I didn’t disbelieve her either. I kept an open mind. An open mind is an enabling state because it allows possibilities to become real. I was in the same open state of mind when I came home after a hysterectomy for endometrial cancer. With a long vertical incision closed by 26 staples, I felt like a badly stitched Raggedy Ann doll. It would have been easy to go into despair, but I decided to wait and see what would happen. Besides, I was well past bikini age and took comfort in the fact that the incision would always be covered anyway. Then, one random day about two years later, I realized that it was looking pretty much normal. We can choose to have an open mind rather than coming to conclusions. By doing so, we give our bodies a fighting chance. After taking care of your attitude, help your body by giving it what it needs and eliminating what aggravates it. This can be a challenge when you’re dealing with conventionally trained doctors. 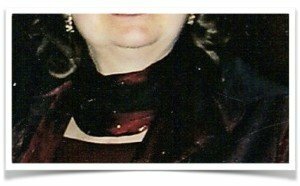 I recall the thyroid specialist who categorically dismissed my inquiry about alternative thyroid support such as desiccated thyroid. Disempowering and demoralizing, to say the least. Much of the healthcare culture is still structured to keep you in your place—the patient who defers to experts as they pronounce what should or should not be done. But things are changing. There are doctors who are open-minded in exploring health issues and looking for answers. Some may be practising in your town or city. Others speak and write about their research and experiences to empower us to take charge of our own health. That’s why I so appreciate the work of Dr. Terry Wahls. Terry Wahls MD was diagnosed with multiple sclerosis in 2000. Despite the best of conventional treatments, she found herself confined to a tilt-recline wheelchair three years later. Determined that there had to be another way, she researched autoimmune disease and brain biology. She made the choice to use food as her medicine and began applying Paleo principles to her unique, nutrient-dense eating plan. To see her now, you would not know that she was once completely debilitated. Her book is rich in information about how the body works, and her three protocols apply it in practical ways. She is a no-nonsense cook and her recipes are easy and tasty. You don’t need to have a diagnosis of MS to find this book useful. The same principles apply to many chronic conditions. I recommend it. Recovery is a wonderful experience, and I’ve noticed that it doesn’t happen in one fell swoop. More next time about being a work in progress. Until then, comments and questions are welcome. This entry was posted in Revelations, All Posts—newest first and tagged thyroid, recovery, principles of recovery, possibility thinking, open mind, body-mind intellignce, empowering, The Wahls Protocol, multiple sclerosis, autoimmune disease, brain biology, Paleo principles, nutrient-dense eating, chronic conditions, Dr. Terry Wahls by Laurana Rayne. Bookmark the permalink.